For the Kazakhstani beach volleyball player, see Alexandr Dyachenko. 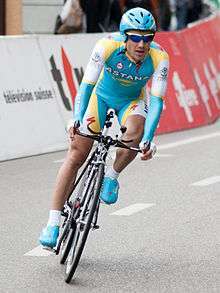 Alexsandr Dyachenko (born 17 October 1983) is a Kazakh road bicycle racer for UCI World Tour team Astana. He debuted his professional career with road bicycle racing cycling team Capec in 2004. In 2008 he joined the Ulan team. But since 2009, he is a member of Astana team. In 2012, Dyachenko put in a solid performance at the Tour of Turkey, where he finished second overall, but the original winner Ivailo Gabrovski tested positive for EPO. In October, it was announced that Gabrovski was stripped of the title, which went to Dyachenko. ↑ "Cycling team Capec". 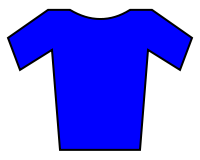 www.world-of-cycling.com. Retrieved April 10, 2011. ↑ "Alexsandr Dyachenko". Cycling Archives. Retrieved April 10, 2011. ↑ Shane Stokes (7 October 2012). "Disqualified Tour of Turkey winner Ivaïlo Gabrovski gets a two-year suspension for EPO". Velo Nation. Velo Nation LLC. Retrieved 7 October 2012.